Turkey itself is a major target for destabilization, upheaval, and finally balkanization through its participation in the US-led siege against Syria. 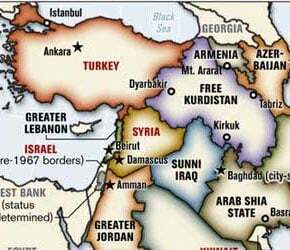 Ankara has burned its bridges in Syria for the sake of its failing neo-Ottoman regional policy. The Turkish government has actively pursued regime change, spied on Syria for NATO and Israel, violated Syrian sovereignty, supported acts of terrorism and lawlessness, and provided logistical support for the insurgency inside Syria. Any chances of seeing some form of Turkish regional leadership under neo-Ottomanism have faded. Turkey’s southern borders have been transformed into intelligence and logistical hubs for the CIA and the Mossad in the process, complete with an intelligence “nerve centre” in the Turkish city of Adana. Despite Turkey’s denials, reports about Adana are undeniable and Turkish officers have also been apprehended in covert military operations against the Syrian Arab Republic. The Turkish Labour Party has even demanded that the US General Consul in Adana be deported for “masterminding and leading the activities of Syrian terrorists.” Mehmet Ali Ediboglu and Mevlut Dudu, two Turkish MPs, have also testified that foreign fighters have been renting homes on Turkey’s border with Syria and that Turkish ambulances have been helping smuggle weapons for the insurgents inside Syria. To Turkey’s eastern flank tensions are building between it and both Iraq and Iran. Baghdad is reviewing its diplomatic ties with the Turkish government, because Ankara is encouraging the Kurdistan Regional Government in Northern Iraq to act independently of Iraq’s federal government. Erdogan’s government has done this partially as a result of Baghdad’s steadfast opposition to regime change in Syria and in part because of Iraq’s strengthening alliance with Iran. Tehran on the other hand has halted the visa-free entry of Turkish citizens into Iran and warned the Turkish government that it is stoking the flames of a regional fire in Syria that will eventually burn Turkey too. Despite all the patriotic speeches being made by the Turkish government to rally the Turkish people against Syria, Turkey is a much divided nation over Erdogan’s hostilities with Damascus. A significant portion of the Grand National Assembly of Turkey or Turkish Meclis and Turkey’s opposition parties have all condemned Erdogan for misleading the Turkish people and stirring their country towards disaster. There is also growing resentment amongst the citizens of Turkey about Erdogan’s cooperation with the US, NATO, Israel, and the Arab dictatorships – like Qatar and Saudi Arabia – against the Syrians and others. The majority of Turkish citizens oppose Turkish ties to Israel, the hosting of NATO facilities in Turkey, the missile shield project, and cooperation with the US in the Middle East. The Republican People’s Party, Turkey’s second largest political party and its main opposition party, has condemned the government in Ankara over Syria. Their leader, Kemal Kilicdaroglu, has openly accused Prime Minister Erdogan of interfering in the internal affairs of Syria. Kilicdaroglu has been joined by Turkey’s other political parties in the condemnations of Erdogan and his ruling Justice and Development Party. Devlet Bahceli, the leader of the Nationalist Movement Party, has warned the Turkish government not to drag their country into a war with Syria through intervention. “Some Western countries have put pressure on Turkey for an intervention in Syria. Turkey should not fall into this trap,” Bahceli, who leads the third largest Turkish political party, has warned Erdogan according to the Turkish press. The Peace and Democracy Party, which is the fourth largest Turkish political party, has also clarified that it is against war with Syria. The politician Selahattin Demirtas, who is one of the leaders of the Peace and Democracy Party, has warned that any military intervention by Ankara in Syria would drag Turkey into a broader regional war. Hasan Basri Ozbey, the deputy leader of the Turkish Labour Party, has announced that his political party will file a complaint against Turkish President Abdullah Gul with the Turkish Meclis and the Turkish Higher Court to prosecute Gul, because the Labour Party “has clear evidence that [Gul] incited terrorism and war on Syria and signed a secret agreement with the United States, which alone is grounds for trial.” Mustafa Kamalak, the leader of the Felicity Party, has even led a Turkish delegation to visit Bashar Al-Assad to show their support for Syria and opposition to Erdogan’s policies. The mobilization of the Turkish military on the Syrian border as a show of force is a psychological tactic to scare the Syrian regime. Any large-scale military operations against the Syrians would be very dangerous for Turkey and could fragment the Turkish Armed Forces. Segments of the Turkish military are at odds with the Turkish government and the military itself is divided over Turkish foreign policy. Erdogan does not even trust half of Turkey’s own military leaders and has arrested forty of them for planning to overthrow him. How can he send such a force to even attack neighbouring Syria or think that he can control it during a broader war? While Turkey is trumpeting that it will not allow Kurdish militias to establish bases in northern Syria, the Turkish government is actually facilitating this itself. There is a real risk of “blowback” from Syria for Turkey. Like Syria, Turkey is a kaleidoscope of various peoples and faiths. The people of Turkey are held together by the primacy of the Turkish language and a shared citizenship. Turkey’s minorities constitute at the very minimum one-third of the country. A significant proportion of Turkey’s minority communities have ties to Syria, Iraq, or Iran. The Kurds and other similar Iranic peoples alone form about 25% of Turkey’s population, which means one out of four Turkish citizens are of Kurdish and Iranic stock. Other ethnic minorities include Arabs, Armenians, Assyrians, Azerbaijanis, Bulgarians, and Greeks. No exact figures have ever been available about Turkey’s Shiite Muslims, because of the historical persecution and restrictions on Shia Muslims in Turkey from Ottoman times. Anywhere from 20% to 30% or more of the Turkish population may be categorized as Shiite Muslims, which includes Alevis, Alawites, and Twelvers. Turkey also has a small Christian minority, some of which have historic or organizational ties to Syria like Turkey’s Alawites and ethnic Arabs. Turkey will be consumed too, one way or another, should a broader sectarian conflict spread from Syria and should the Syrians be violently divided along sectarian fault lines. All the factors discussed above are a recipt for disaster. Civil war in Turkey is a real possibility in an increasingly polarized Turkish state. Should Syria burn, Turkey will ultimately burn too. This is why a whole spectrum of Turkish leaders have been warning their country and people that the consequences for the fire that Erdogan, Davutoglu, and Gul are stroking in Syria will have disastrous consequences for Turkey and all the countries bordering Syria. Mahdi Darius Nazemroaya is an award-winning author and geopolitical analyst. He is the author of The Globalization of NATO (Clarity Press) and a forthcoming book The War on Libya and the Re-Colonization of Africa. He has also contributed to several other books ranging from cultural critique to international relations. He is a Sociologist and Research Associate at the Centre for Research on Globalization (CRG), a contributor at the Strategic Culture Foundation (SCF) in Moscow, and a member of the Scientific Committee of Geopolitica in Italy. He has also addressed the Middle East and international relations issues on several news networks including Al Jazeera, teleSUR, and Russia Today. His writings have been translated into more than twenty languages. In 2011 he was awarded the First National Prize of the Mexican Press Club for his work in international journalism. The Globalization of NATO (Clarity Press) by Mahdi Darius Nazemroaya. 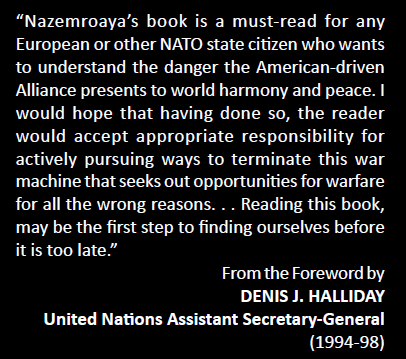 Foreword by Denis J. Halliday.